In the early 1990’s, Hip Hop Culture gave birth to the original messenger group, X Clan. The original four members were Professor X (The Overseer), Brother J (The Grand Verbalizer), The Architect Paradise and Sugar Shaft (The Rhythm Provider). This group demonstrates a unique chemistry of Hip Hop artistry, production and social movement development for youth and elders pressured by social injustice. 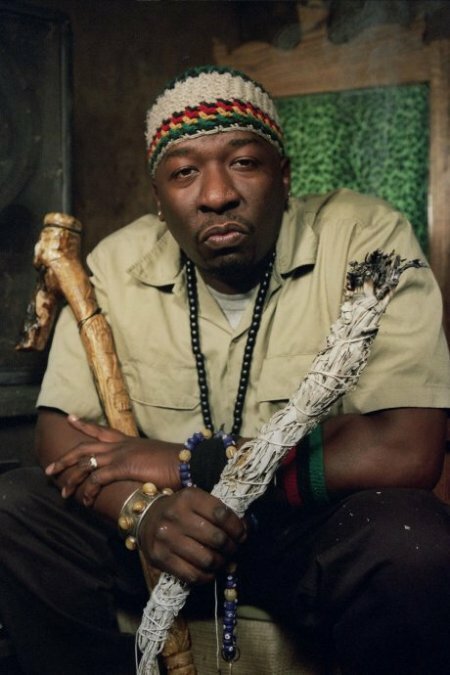 Influenced by icons like Bob Marley, Sun Ra and George Clinton; X Clan chose the path of messenger group and was introduced to the music mainstream by 4th and Bway/Island Records. X Clan introduced a signature sound and image reflecting the ancestors of indigenous cultures to eldership of today. Their debut album, To the East Blackwards (1990), became a Hip Hop Classic; opening the doors for national and worldwide music charts, video shows, magazine covers and awards in the grassroots community and the music industry. Regardless of the publicity and mainstream acceptance, X Clan has always held true to their mission to channel intelligence and inspiration through Hip Hop Music. As an Ambassador of Hip Hop Culture, Bro. J works with community organizations to bridge the gap between elders and youth in promoting ancestral studios, creative writing, social interaction and Hip Hop Culture. Brother J has founded the Culture United Movement which incorporates his experiences as a world traveler and lyricist, to merge entertainment and education for diverse cultural audiences. In June 2011, Bro. J received resolutions from the Cities of Compton, Carson and the California State Assembly in recognition of his exceptional achievements, dedication to the community and contributions to African history and culture. He has joined prominent scholars in lecture forums to educate and deliver messages of truth and enlightenment. Bro. J and X Clan are living proof that conscious music has its place in the commercial and independent market. He is currently working on a solo album due for release fall 2012. X Clan is also currently working on a new album for 2013. Their previous releases, Return from Mecca (2007) and Mainstream Outlawz(2009) are available on Suburban Noize Records.